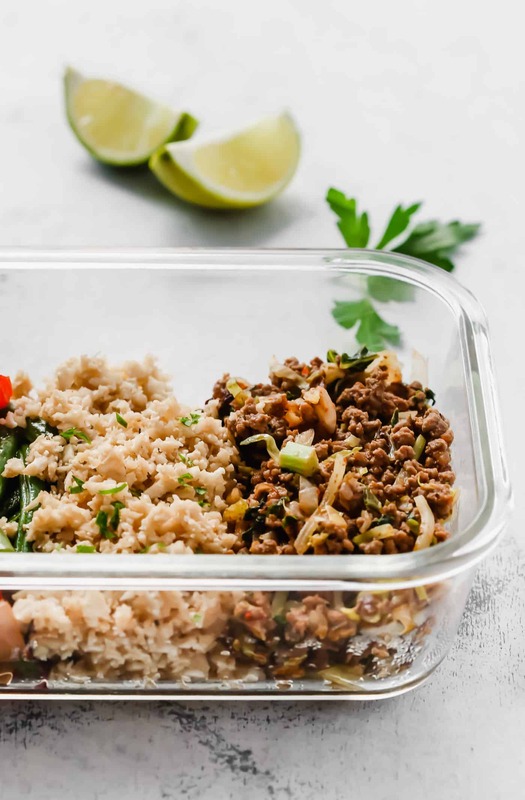 I have an easy, flavourful and low-carb Ground Turkey Cauliflower Rice Veggie Bowls for you today. It’s loaded with veggies and extra-lean protein. Yesterday I went to the optometrist for a follow up appointment. I have an inflammation on my right eye right, but it’s getting better. I have to use the medications (drops) until Monday to make sure the inflammation is gone and won’t come back soon. I have this inflammation every year for over 3 years now. It normally flares up every 6 months but it last only few days and to be honest I’m already used to it. I mean of course it’s annoying and it messes up my day-to-day activities, but I learned how to deal with this well. In another post I’ll talk more about it and why I have it. But now let’s jump to the recipe because “Oh boy it’s worth it”!! 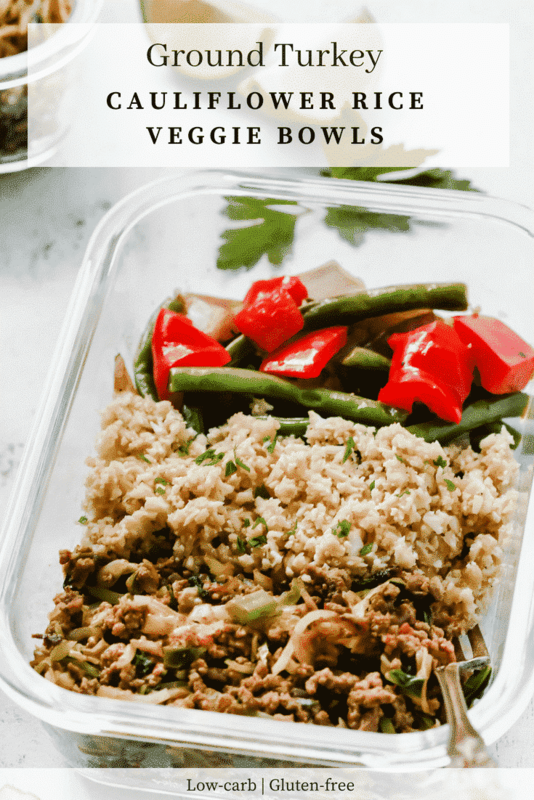 This Ground Turkey Cauliflower Rice Veggie Bowls is a complete meal with lots of good protein and veggies. 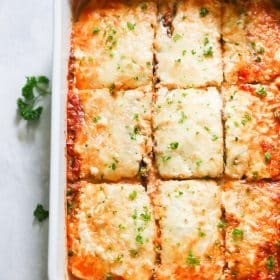 In addition to being a low-carb meal with cauliflower “rice”, this recipe is also great as a leftover that’s why it’s a great option to bring to work. It stays good in the fridge for about 4 days. 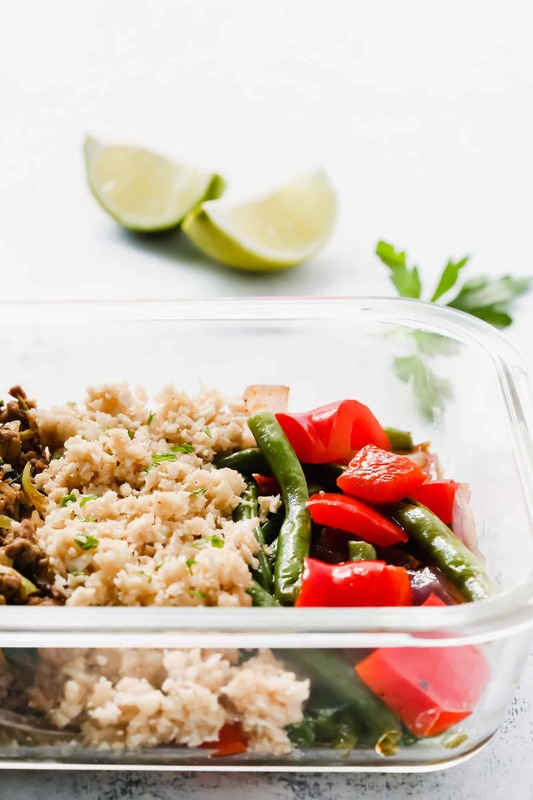 Bring on the Veggies –This recipe is also packed with some serious and delicious veggies such as bell pepper, red onions and green beans. I sautéed all the veggies in a cast iron skillet with a good extra-virgin olive oil, coarse salt and freshly ground black pepper. Mm… so good! 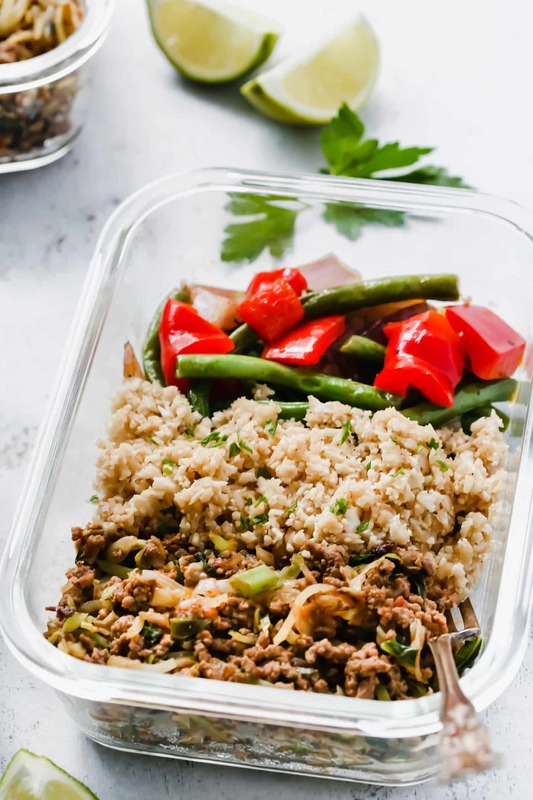 Extra-lean protein – This Ground Turkey Cauliflower Rice Veggie Bowls is loaded with lean protein. I used 90% lean ground turkey, but if you prefer ground beef with a little more fat, you can certainly use a different type of meat. Low-carb “rice” – Who doesn’t like some good fluffy rice, right? But what we don’t like as much is all the carbs in there. I get it and that’s why I bring to you this D.E.L.I.C.I.O.U.S cauliflower “rice”. I made it by processing all the cauliflower florets in a food processor and sauté it with sesame oil (adding more flavour), garlic and soy sauce. Absolutely yummy! But just be aware that soy sauce it’s not gluten-free. You can use coconut amino instead. When it comes to food store I always prefer to use glass containers because they’re better for your healthy and for the environment. Why I say that? Because some researches are saying that toxic substances migrate from plastic to food during microwave heating. This doesn’t happen with glass containers. Also, glass containers are easily recyclable in plants to make other glass materials and it can be reuse many times. When you choose glass rather than plastic you help to reduce the amount of plastic that goes to pollute nature. If it has leakproof lids to avoid spills. Also buy a good quality glass container that won’t break easily. Make sure it’s safe to use in the microwave and it’s freezer-safe tempered glass too. And finally, buy different size containers because it will help to stack them easily and take up less space in fridge. At Amazon.com you can find a huge variety of glass containers with different sizes and with or without compartments. Check them our here (affiliate link). 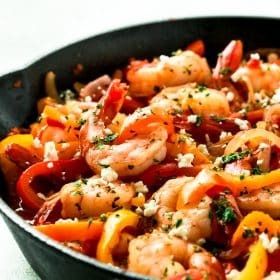 Garlic Shrimp Asparagus Skillet: This recipe is low-carb, gluten-free, Whole30 and paleo friendly! It’s one-pan meal and it’s ready in 20 minutes. Ground Tukey Sweet Potato Skillet: One of the most popular recipe on the blog and perfect for meal-prep on Sunday. You should try this recipe because it’s so worth it. Garlic Butter Salmon in Foil: This recipe is amazing as leftovers and I love to serve it with some cauliflower rice. Yummy! Garlic Butter Trout in Foil: Make this trout fillet recipe for the whole week and have for lunch during the week at work. Serve with salads, cauliflower rice or even mashed cauliflower. Asparagus Stuffed Chicken Breast: This is the one of the most flavourful chicken recipes I’ve ever tried and yet very easy to make. 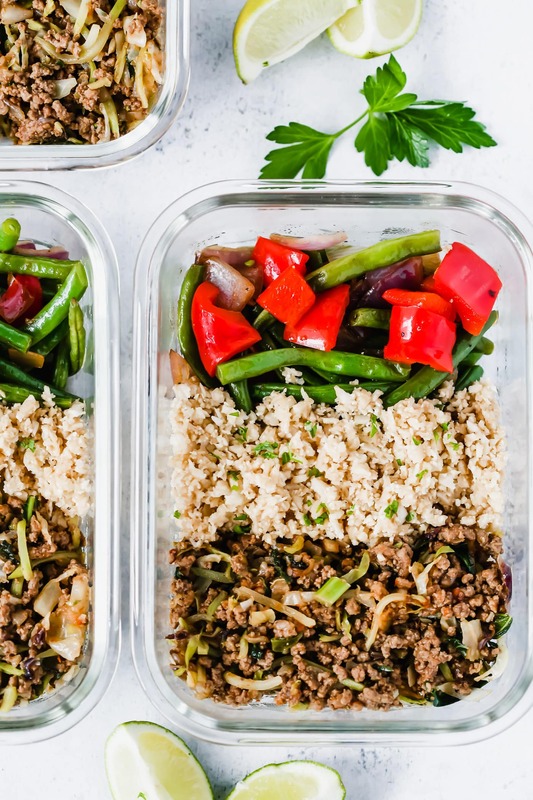 So, ready to jump to the recipe box and make this delicious Ground Turkey Cauliflower Rice Veggie Bowls? In a cast iron skillet, heat olive oil over medium high heat. Add onions and sauté for 3-5 minutes or until the onions are tender. Add ground turkey and all the spices. Using a wood spoon break up the turkey. Cook for about 7 minutes and don’t forget to stir occasionally. Add cabbage, kale, brussels sprouts, vegetable broth and mix well to combine. Cook for about 4 minutes. Stir occasionally. Pour tomato sauce and season with salt and black pepper. Cook for more 3 minutes or until the veggies are cooked through. Set aside. In the same large skillet you used to cook the ground turkey, add 2 tablespoon of sesame oil over medium heat. Add garlic and sauté for 30 seconds. Add the cauliflower rice and soy sauce. Mix everything well to combine. Be careful to not overcook the cauliflower otherwise it will become soggy. Set aside. In the same large skillet you used to cook the ground turkey and the cauliflower rice, add 2 tablespoon of olive oil over medium heat. Add all the veggies, salt and black pepper and stir well. Cook until the veggies are tender. Be careful to not overcook them. Place an even amount of ground turkey, cauliflower rice and veggies into 4 different glass containers. Cover with the lid and place in the fridge for up 4 days. Heat in the microwave for about 1.5 or 2 minutes. The time will depend on the power of your microwave. If you like to meal-prep on Sunday, I have other meal-prep recipes HERE. But my favourite meal-prep recipes are these ones: Spicy Salmon Vegetable Meal-Prep Bowls, Spicy Chicken Meal-prep Bowls and One-sheet Pan Shrimp with Cherry Tomatoes. 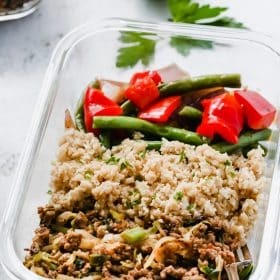 And if you like this Ground Turkey Cauliflower Rice Veggie Bowls recipe, please share with your friends and family. Do you want to taste more? Subscribe to my newsletter and follow Primavera Kitchen on Twitter, Pinterest, Google+, Instagram, and Facebook for all delicious recipes updates. As always, I really appreciate you stopping by. I made this on Sunday for my lunches this week and its delicious! A friend sent me a link to this recipe and so very glad she did. I have one question though, in the ingredients it calls for vegetable broth. However, I didn’t see anywhere in the cooking instructions where to actually use the broth. Mine still turned out great but just wondered if I missed something. Hi, Jennifer. You use the broth while cooking the ground beef. Thanks a lot for pointing it out. I just adjusted the recipe to clear further confusion. What are the nutritional facts in this recipe? I will add soon. Thanks. I just added the nutritional facts in the recipe box for you. The nutritional facts, is that for the recipe as a whole or per serving? When you say “4 cups cabbage, kale, and Brussel sprouts”, do you mean 4 cups of each? No, I mean all together. About 3 to 4 cups.